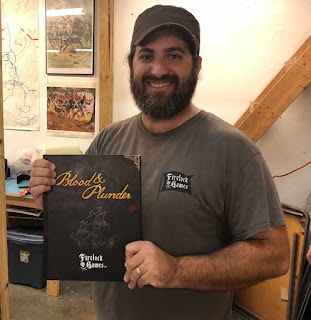 For our May 2018 club game we were lucky to have Mike from Firelock Games come to our Fort Lauderdale Florida club house (Das Krieg Haus) and run a large demo game of their Caribbean Pirates game system called Blood & Plunder. Mike is an awesome guy and their company sells great products. 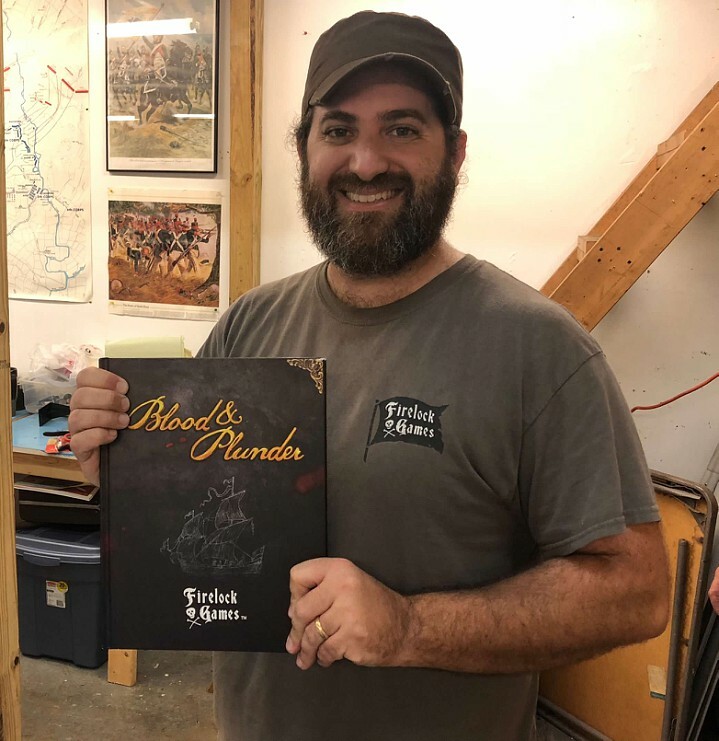 Blood and Plunder is a set of 28mm miniature wargame rules set in the 17th century during the golden age of piracy. These rules are a glossy type set, beautifully produced, with great photos, and easy to understand. I like the card driven movement sequence system with command points to allow for extra actions and re-rolls. 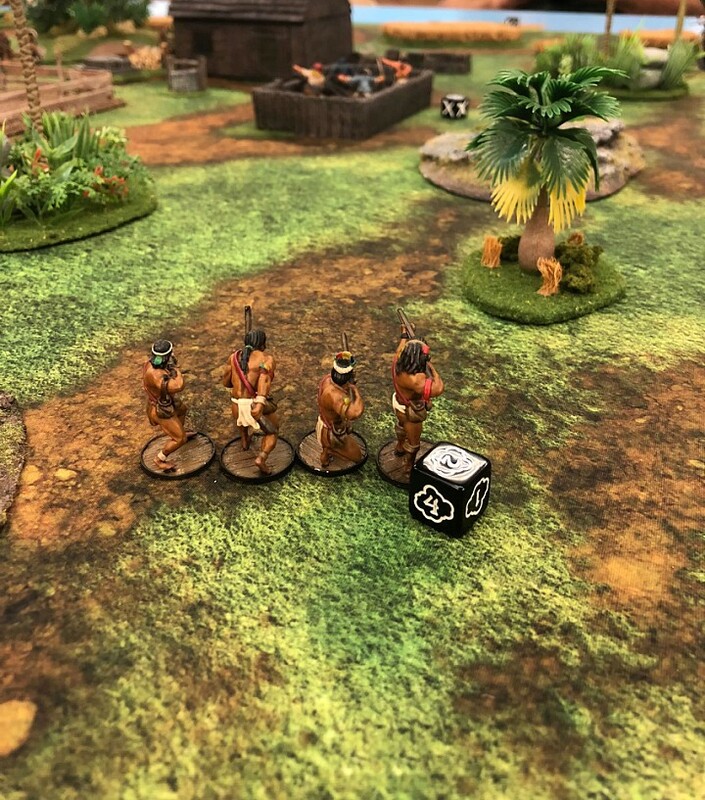 The slight nuances for the different troop types really provides the right feel for this period and creates unique tactical challenges for the players of the different nationalities and troop types. Each troop type has a different attack and defense value based on the national characteristics of the time, historical accounts, their armaments, and their level of drill and training. Some units can move more while some have special attacks, or better morale, etc. The unit cards contain the specifics particular to each nationality and troop type for movement and combat and are referenced throughout the game. Each unit of several figures is activated by a command/action card which denotes their number of actions it may take based on the unit's level of experience and in what order of play based on the card suite and number. A standard card deck can be used instead, but these are a lot more fun. In the larger game version which is what we tried each command of 2-3 units had one action card per turn with the overall commanders having their own card as well. 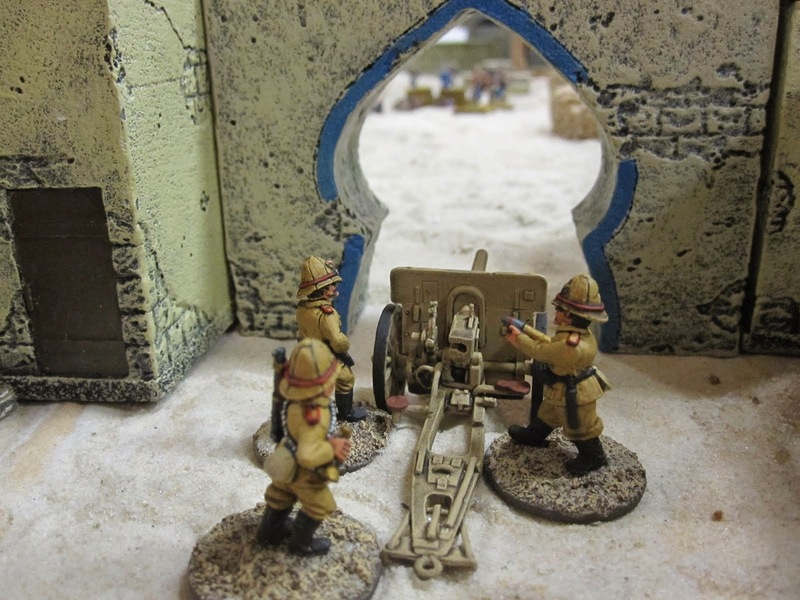 As with most wargames the GM designs the scenario and the players pick sides. The GM gives the players and commanders of each side the action cards for their units or commands based on their nationality and troop type. 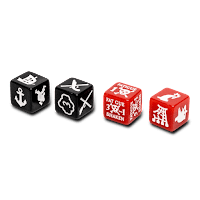 If there is no GM The players choose their action cards from their action decks. Each turn begins with the drawing of a hand of the action/movement cards, each player throws out an action card from their current hand. These cards are then played against their opponent to try and get the advantage of either moving first or undertaking more actions. The players decide if they want to try and get the jump on the other player or try to make them go first to be able to react to their opponents. The player with the higher number card goes first, ties are broken with a comparison of color, suite, number, etc. 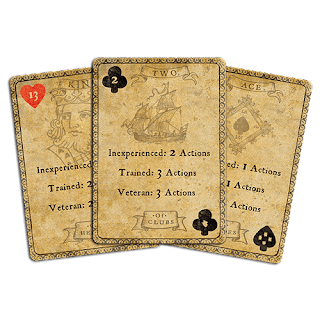 Once its confirmed who goes first the player consults their action card for the number of allowable actions and their unit cards to see if there are any special actions, movement, attacks, etc, that the unit can carry out this move. When done the opposing player does the same thing with the loosing card they threw and then the next movement cards are thrown against each other. This procedure is followed until all the cards from the players current hands are thrown and all the units / commands have executed their actions or chosen to hold, this ends the turn. The commanders pick another hand of cards from their action decks based on the number of commands or units they have and start another turn by throwing out a card against each other. This procedure is repeated until the game is over based on the scenario and objectives. I like the combat system, it’s simple and fun. The units build up fatigue based on hits and after so many fatigue markers are accumulated the figs perish or fail a morale roll. I’m not a big fan of saving throws, however in a very small-scale skirmish game like this it has its merits. I really like the command points, they can be used to add an action, change the cards in your hand, or even a re-roll as desired. 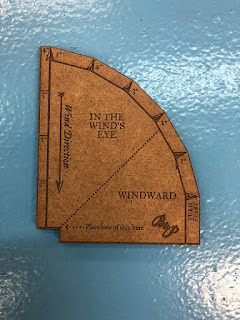 The number of command points are finite and represented by a miniature copy of an old coin, which is very cool indeed. 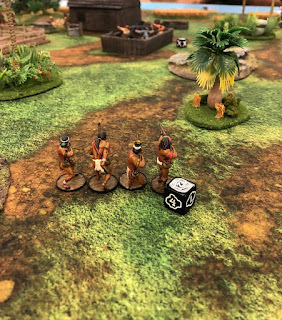 This game system has some similarities to the “Congo” rules set in the use of the action and movement cards to determine the number of actions taken, who goes in which order, as well as the unit cards which contain special abilities or actions the units can take. The other similarity is the game scale with small units of 5 to 9 figures and their tight formations. 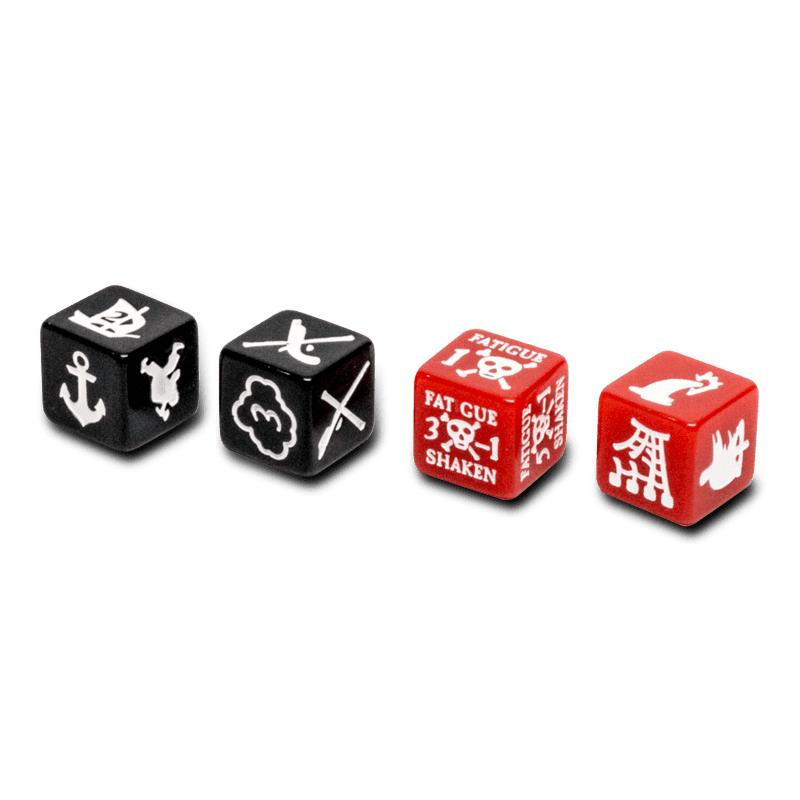 There are many products from this company which are specially produced for this game system and all of the accoutrements for the game is very well done and adds to the fun. 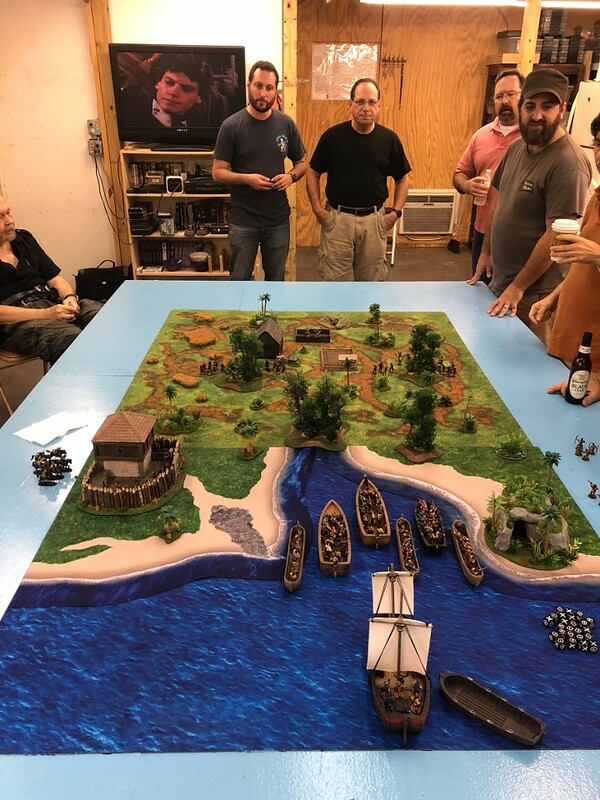 There are ship turning gauges, movement cards, unit action cards, command coins, dice, markers to track all game effects, and a plethora of very detailed miniatures and amazing boats. The scale of the figures is quite large even by today's heroic 28mm standards, but are very well done. The boats are also excellent and can easily be used with any 25 to 30mm figures on the market today. For our first game we concentrated mainly on the infantry actions so we only had one ship for our test game. I would really like to try another game with more of a naval contingent. 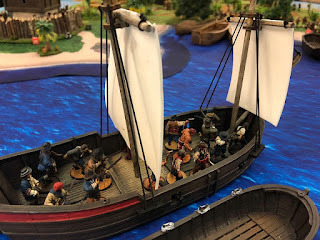 For many years we’ve used the old “Limeys & Slimeys” rules for all of our naval and pirate actions, though we have used a supplement for “The Sword And The Flame” for pirate land actions in the past. Having said that I do like these rules and very much look forward to playing them again sometime soon. Check out their awesome website or FB page to see instruction videos, historical background, picture gallery, products, etc.